Is TV important in France? At first, television probably isn't very high on the list of things that you think you will miss when you move to France (Living in France). Certainly when we moved here I didn't really give television a thought, as I was far too busy dreaming of sun-filled summers, winters on the ski slopes (Ski Chalets for Sale in France) and dabbling my toes in the Med. After that, I was too busy organising vaccinations for the animals (Pets and Animals in France), making sure that our passports were up to date and taking French lessons (Learning to speak French - Misadventures in a Foreign Tongue), to give TV a second thought. I've never considered myself a TV addict anyway, so it didn't seem important. However, once the excitement of the move had settled into everyday reality (though it is still a wonderful reality!) we all began to feel that there was something missing. We began to think that that glass of wine in the evenings, particularly in the winter when sitting outside isn't an option, would go down better with an interesting programme to watch on TV. Before we begin the discussion of the television options available to ex-pats in France, it is important to understand the licensing system in operation here. It is different from the UK system, as the TV licence is paid as part of the annual taxe d'habitation. At the time of writing a licence costs 116 Euros, and the television must be declared on your income tax return. (Tax in France.) You must declare your TV even if you do not have it connected to any set top box or satellite. Your TV is still taxable even if it is not able to receive any channels. Equally the oft used excuses of; "We only get British television, not French" and "We only use it to watch videos and DVDs" will not wash either! If you purchase a TV in France your address will be passed onto the authorities for tax. Will a British TV work in France? We purchased a French television receiver, with box and satellite dish to receive all the free French channels, of which there are five, known as TF1, France 2, 3, 5 and M6. Everyone told us that this would improve our French no end, so we sat down to watch. Game show followed soap followed game show followed soap followed by a... game show. Now in England, if there was one kind of television show guaranteed to make me switch off it was a soap or a game show. Here in France there was the added irritation of not being able to understand a word that was being said! We gave up on French "game show TV" and tried again the next morning. The good news is that on France 2, each morning, there is quite a watchable news/magazine programme. Similar in style to a British morning news programme such as Sunrise (Sky), it mixes news, weather, local news, health, beauty, fashion, films, sports etc. It is actually quite good for your French too... BUT guess what comes on when it finishes... yes, you got it... a game show! In general, French television is disappointing. Slapstick or very visual comedy such as the Benny Hill Show and "Mr Bean" are inexplicably popular here, and there really are an inordinate amount of game shows and soaps. Sports coverage is pretty good, with French interests in many big sporting events shown live. Midsomer Murder is being shown at the time of writing, under the name of "Inspecteur Barnaby"! The problem with shows like this, and also with the films shown on French TV, is that they are often irritatingly badly dubbed into French, with the actors' lips moving at very different times from the sounds! Is French TV worth it? Is it worth having French TV installed? On balance, I would say it is a good idea, it does help your French, and it's good to be able to access local news at least. However, I would imagine that all but the most hardy will want access to some good old British TV too! If you want access to much more televisual choice than ordinary free view French television allows, you can subscribe to one of the main "pay channels" of Canal Satellite or TPS. It is also possible to subscribe to Canal Plus, and have access to an even greater range of programmes including a certain amount of English language programmes. These TV services are encrypted, and offer channels such as Eurosport, the History Channel, MTV and others familiar to satellite and cable viewers in the UK. Many people who only watch a little television are happy with the limited services provided by a Freesat box attached to the television. With one of these you can access channels such as BBC1 and 2, ITV 3 and 4, Sky news and quite a few others. This offers considerably less choice than a full Sky package, but many find it sufficient for their television needs. 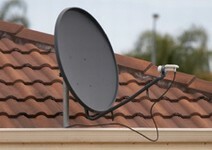 The box is inexpensive (at the time of writing around 100 Euros) but you will also need a satellite dish aligned to receive the service. New channels are being added to the service regularly, so be sure to check exactly what is included before you make a decision. By far the most popular option amongst ex-pat Brits, however, is Sky television. Not only does this provide you with all the viewing options you enjoyed on your TV in the UK, but it also has a full range of radio shows. You can even listen to good old Terry Wogan in the mornings, via your Sky satellite, or keep up with events in Ambridge if you are an Archers addict! There are various ways of receiving Sky on your television in France, but you cannot inform Sky that you are living in France and still receive their service. This, of course, raises both difficulties and controversy. Traditionally, ex-pats found a way around the problem by simply continuing their subscription from their old address in the UK, whilst taking all the equipment to France and re-aligning the satellite to receive the channels. This is all very well until you need a new card, wish to update your subscription or need a new service adding, such as Sky Plus or Sky Multi Room. In these instances, Sky want to come to your address in the UK to fit the services, and this is not possible for obvious reasons! There is, however, a great way to avoid these issues and still enjoy your favourite programmes. "Sky in France" (www.skyinfrance.com) is a company set up to operate within France to overcome the problems. There are many advertisements in English Language papers offering to install Sky equipment, but it is definitely a good idea to use a reputable company such as those who have the all important Siret number and who are accountable for the quality of goods and services they provide. Regarding prices, Alan Agate, of Sky in France, says; "If you choose to take a subscription, the packages and costs should be the same as in the UK. There will be a charge made for a viewing card and an annual renewal fee and you will have to take out a 12-month contract at first after which you may give 30 days notice. The charge is to cover the costs of activating the card, organising a UK address and dealing with any ongoing viewing issues." Alan is also at pains to point out that any controversy surrounding the watching of Sky in France is unjustified. Many people mistakenly think that because Sky are not able to provide the service if they know that you are living abroad, the receiving of the service is therefore illegal. Alan can reassure you that this is not the case. He explains it like this: "The reality is that Sky do not have the rights to broadcast outside the UK but it is perfectly in order to receive it. Just walk down the seafront on the Costa del Sol and you will see every other bar openly advertising Sky Sports. Sky simply must not knowingly broadcast." Alan and his business partner Richard Westbrook can be contacted on info@skyinfrance.co.uk or skyineurope@aol.com. Alternatively, look at their website Sky TV and Satellite SKY Installation Service in France. Is television in France worth it? Some people may find that their new lives are perfectly happy and full without a television, whether it be French TV or any other kind of TV. The lovely countryside, fresh air activities and excellent food and wine is enough for them. Most, however, seem to find that they do want to watch at least a little television, and those who move to France with children can certainly find their lives a little easier if the kids can at least access familiar and well loved TV programmes in a language they understand! French TV is great for language learning, but many will appreciate some light relief too, especially after a day of grappling with the language in an alien classroom environment (French Education System - Schools in France, French School - experiences of a 14-year-old). Before making your decision, look into all the TV options, and choose the one that is right for you. Make sure you buy your television equipment and services from a registered and reputable company, pour that glass of wine, switch on, relax and enjoy! Read your page with great interest thanks. I have just bought an apartment in France and reading your page, I think Freeview is best for me; what is the best way to do this, do you know? "You can buy the box and dish from any good sized supermarket... well, you can here in the Languedoc! We got ours from Geant. Not expensive, the only problem you have is getting the dish aligned when you set it up. We have a friend who helped us as he had a handy piece of equipment but maybe you can buy these. Perhaps ask at the supermarket when you buy the box and dish, or perhaps you could advertise on a local forum to find someone who can do this for you." I read your information about TV sets in the UK and France with interest. I have a question that goes the other way around and wonder whether you have the answer. If I buy a new digital TV in France, will I be able to take it back to the UK and watch the "free" channels in the UK? The reason for this question is simply that my region in France went digital last summer and my PAL/Secam set there no longer works. For reasons of physical mobility, I am not sure for how much longer I will be able to live in France and before I buy a new set in France, I would like to know whether I could take that set back to the UK. Retailers in both France and the UK have given contradictory opinions, ranging from "of course you can! that's what digital is all about - but we refuse to put this in writing" to "absolutely not". The two manufacturers that I have approached, Samsung and LG have not responded. Thank you for any assistance you can give. PS. And yes, I am appealing the decision to charge me a licence fee for a set that has not worked since the digital change-over on 4 July 2011. The law, as quoted by the Ministry of Finance on its own website, states very clearly that "the set must be capable of receiving digital broadcasts". The hassle of the procedure is probably not worth the trouble: my appeal tribunal is three hours drive (and no public transport!!) away from where I live. But there is a principal at stake. Thanks for contacting us. I have been in touch with my colleague Joanna in France who says she would have thought a digital TV with Freeview would work in the UK as it picks up the British channels in France. However, as neither of us are experts in this field and you don't seem to have had much luck with retailers and manufacturers, it might be worth you trying to contact an electrician, perhaps one listed on our site (under the Services section), to see if they are able to confirm this one way or the other. Hello. A French digital TV or set top box (whether "TNT"for terrestrial or a satellite box) will basically work in the UK. There may be problems with the programme guide as this equipment is not fitted with the "Freeview" or "Freesat" software. I have personally used a French TNT box in the UK. I brought back from France to England a three-year old Samsung television set. By using the menu I changed the country to UK and the language to English and then went into plug and play (channel search) mode and it scanned automatically for DTV channels. It was very simple and I have an excellent quality of picture and a full range of freeview channels. Sorry to bother you. I am 79 (but I usually tell everyone I am 21!). What I am trying to find out is, do I have to pay for the television licence in France? I have just come to live in Salies-de-Bearn. Thank you in anticipation of your help. I would suggest you contact your local council offices (Centre des Impots Fonciers or Bureau de Cadastre) for confirmation of this. They can then apply the exemption if appropriate. Can you recomend an engineer to install my free sat and dish in my area? I'm in a small village LE MAS near to LA COQUILLE department 24. Thanks for contacting us. I can only suggest you try contacting some of the electricians we have listed in our Business Directory, to see if they work in your area. We purchased a derelict property in France about five years ago. We have done nothing with this place yet, but I have noticed with my bills on this property that I am paying a television license/habitation tax. How can I explain that I do not have a television? The property is completely empty, with electricity and water shut off. Please can you help, many thanks. Thanks for contacting us. I am not sure if you have read our article on "Taxe Fonciere and Taxe d'Habitation - property tax in France", but if not it may be of interest. You will need to contact your local council offices (Centre des Impots Fonciers or Bureau de Cadastre) to sort out your TV Licence, as you should obviously not be paying this if you have no TV. Regarding your Taxe d'Habitation bills, I understood that if property is not yet habitable, ie: not furnished and with no services connected, then you should be able to get a discount or exemption from Taxe d'Habitation. Your Mairie may also be able to help. Do you need to declare mobile devices for TV licence tax if you watch UK TV such as Iplayer over a broadband Internet connection in France? Thanks for contacting us. My colleague Joanna, who used to live in France, is not entirely sure about this but feels you may have to pay for a TV Licence. This is normally automatically added to your Taxe d'Habitation bill however, so if it hasn't been added then you could be lucky. If it has, you will need to contact your local council offices (Centre des Impots Fonciers or Bureau de Cadastre) to argue your case. Is there an age exemption for the French TV licence? I used to pay with the Taxe d'habitation but now it says 0.00 for the TV licence. I'm 65 now. Thanks for contacting us. I understand exemptions do occur but they are based on your French tax return and your income, not just your age. So it would seem this exemption has applied to you. If you have any queries, you can always check with the office concerned. Hi - we have a holiday house & a gite in France. Neither house has a TV of any description but we listen to French radio & internet radio. Do we have to pay for a TV licence please? Thanks for contacting us, though I am afraid I'm not sure of the answer to your question. I can see the sense in not paying it, as you say you don't possess a TV and don't watch TV, but this is France we are talking about. Though as this is normally automatically added to your Taxe d'Habitation bill, if it hasn't been added then you could be lucky. If it has, you will need to contact your local council offices (Centre des Impots Fonciers or Bureau de Cadastre) to argue your case. We regularly receive an opt out form to re-state we have no TV so assume we don't pay. We live in Switzerland by the way - don't know if this has any bearing?! Maybe one day they will do a dawn raid to try catch us out! Many thanks for your response. Hello - I have a summer home in France, never spend more than two months per year there. I am not a resident. I do pay Taxe d'Habitation and Taxe Fonciere. Is the TV tax required if I am not a resident? Is it included with the Taxe d'Habitation tax as you have alluded to above? Thanks for your help. Thanks for contacting us. In answer to your questions, I understand that if you have a TV, then you will have to pay for a TV Licence (la redevance audiovisuelle), which is paid as part of your Taxe d'Habitation. It does not matter if you are not a resident, or only there for two months a year. Hi - we recently moved to the Languedoc and have successfully installed a 100cm satellite dish to pick up about 260 channels including all the UK ones we wanted (oh and about 255 other useless ones..!). We would now quite like to access the free French channels to improve our French - the question is... do we need a new dish to be able to do that, or perhaps just some different decoder box of tricks?Many thanks. Thanks for contacting us. I think this may depend on your TV, as to whether you need a box to pick up free French channels, but I was under the impression that the same satellite dish could be used. As I am no expert in these matters however, it may be worth asking someone who is. Have you asked whoever installed your dish how you might do this? Or you could try contacting some electricians who work in France, perhaps using our Business Directory. Hello, this is the most helpful site I've visited so far on the TV subject. I have a holiday home in Herault, there is an old sat dish and cabling in place and I'm wondering if I connect a British bought TV to it will I be able to pick up any TV channels? Do I need to buy a receiving box and what are the options? I'll be happy enough with the free French channels. Has France switched to digital only or could I pick up some French channels with an old fashioned aerial? Thanks! Thanks for contacting us. I would think it may depend on how new your TV is, whether it has a decoder in it. New TVs should work. Also it may depend on how old the aerial/cabling/sat dish are. They may need to be upgraded. But essentially UK bought TVs do work in France, and should give you access to numerous TV channels. France has switched to digital. For expert advice though I would suggest you contact an electrician who works in France, perhaps using our Business Directory? UK Digital TV can be received, subject to a suitable antenna, in the Calais area, part of the Normandy coast, Cherbourg and those parts of the Brittany coast which have a clear line of site to Jersey. High pressure weather systems sometimes break up the signals. French TV can be received clearly along the coast, in the UK, from Folkstone up to Ramsgate, on high ground on the south-facing South Downs and along the south coast of the Isle of Wight. In the Channel Islands both the Normandy and Bretagne Versions of TF3 can be received, subject to a directional antenna.